Many recently developed concepts and technologies are seen as contributing to Web 2.0, including weblogs, linklogs, wikis, podcasts, RSS feeds and other forms of many to many publishing; social software, web APIs, web standards, online web services, and others. Proponents of the Web 2.0 concept say that it differs from early web development, retroactively labeled Web 1.0, in that it is a move away from static websites, the use of search engines, and surfing from one website to the next, to a more dynamic and interactive World Wide Web. Others argue that the original and fundamental concepts of the WWW are not actually being superseded. Skeptics argue that the term is little more than a buzzword, or that it means whatever its proponents want it to mean in order to convince their customers, investors and the media that they are creating something fundamentally new, rather than continuing to develop and use well-established technologies. On September 30, 2005, Tim O'Reilly wrote a seminal piece neatly summarizing the subject. 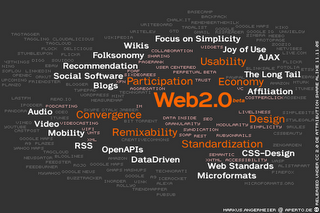 The mind map above sums up the memes of web2.0 with example sites and services attached. It was created by Markus Angermeier on November 11, 2005. What is now termed "Web 1.0" often consisted of static HTML pages that were updated rarely, if at all. They depended solely on HTML, which a new Internet user could learn fairly easily. The success of the dot-com era depended on a more dynamic Web (sometimes labeled Web 1.5) where content management systems served dynamic HTML web pages created on the fly from a content database that could more easily be changed. In both senses, so-called eyeballing was considered intrinsic to the Web experience, thus making page hits and visual aesthetics important factors. Proponents of the Web 2.0 approach believe that Web usage is increasingly oriented toward interaction and rudimentary social networks, which can serve content that exploits network effects with or without creating a visual, interactive web page. In one view, Web 2.0 sites act more as points of presence, or user-dependent web portals, than as traditional websites. They have become so advanced new internet users cannot create these websites, they are only users of web services, done by specialist professional experts. Access to consumer generated content facilitated by Web 2.0 brings the web closer to Tim Berners-Lee's original concept of the web as a democratic, personal, and DIY medium of communication.